Another missive from the “Idiot Fondue” archives, wherein I posed as a psychotherapist and responded to inane queries from creative readers. Enjoy. Sometimes I need to eat quickly and cheap, but I’m having a fast food dilemma. That guy in the Burger King outfit really creeps me out, the way he stares with that silly grin plastered on his face. And come on, TIGHTS? Then there’s Ronald McDonald, a grown man who disguises himself with baggy clothes, makeup, a wig, giant shoes (???) and tries to lure small children into his building. That Wendy cartoon chick has crazy eyes. What about Colonel Sanders with his wee, beady eyes and “secret herbs and spices?” And don’t even get me started on that damned chihuahua from Taco Bell. So, to make a very long letter even longer, where can I eat without being stalked by these scary mascots? I’m very impressed with your surfacing of this issue, proving that you are somehow on the cutting edge of psychiatry, even though, if your postmark is to be believed, you hail from a small Oklahoma town where they still believe in such things as designating an individual to be “Butter Queen of the Pickle Festival” each October. I was just on a conference call with several colleagues from Bornsdall University, wherein we were making tactical plans to deal with the expected influx of patients exhibiting symptoms just as you have described. The technical term for this condition is known as Doughboyphobia, or the acute fear of food-related mascots. I assure you that this syndrome is very real and can be potentially dangerous. This is not one of those “pretend” maladies that they come up with on your local evening news just so you will stay tuned and boost their ratings. If you actually believe even half of what you see on privately-run local stations, you would never leave the house. Sadly, as of this writing, there is no known cure for Doughboyphobia, despite the intense efforts of an international team of experts with names that look like sound effects in violent cartoons. While I’m sure there will eventually be a formalized announcement of the most promising treatment, it may be some time before the findings are published and the common populace is free to eat cheap food on the run without fear. So, there you have it. Basically, I am to proceed as if it were just another day wherein I lead the misguided, the confused, and the financially-solvent toward a better light. As such, it’s imperative that we examine closely the specific nature of your discomfort with the scenarios you presented above. If we can pinpoint the exact trigger of your psychotic break with each of these food-based exercises in merchandising, I believe it will give you temporary relief until the inevitable and appropriate narcotizing prescription becomes available. Let’s start with that King of the Burger business. You realize he is not actual royalty? This alone should soothe your soul to some degree. He cannot issue any type of ruling that can affect you in any way. He cannot take away your land. He cannot arrest you for speaking ill of the king. He cannot insist that you send him a goat each month for taxation purposes. And, if my instincts are correct, he cannot do the thing you fear the most about this King of the flame-broiled meat: He does not have the means to make you his personal serving wench, wherein you must wear dirty, ugly outfits and bring him an endless supply of mead and turkey legs. This will not happen. Breathe. Now, doesn’t this make one feel much better? This supposed king has no power, much like the Vice-President of the United States and anyone involved with the effort to keep the Humanities alive in our public-school systems. He has a pointless title, does not command an army of any type, and has never been invited to royal social gatherings in the south of France. That being the case, his atrocious little outfit means nothing. The silly grin? Let it trouble you no more. And the tights? Well, that one’s a bit tricky, with it’s possible reference to lewd and salacious desires, but again, we must ignore the legs encased in stretchy material. This is a good rule regardless of who might be sporting the tights. I’ve never understood why anyone would wear them, unless you were performing one of those boring ballets, and even then there are some serious questions that should be answered. Moving on to Ronald McDonald, we have yet another example of why people should not be allowed to dress themselves without the proper training and consultation. As you have surmised, there is something unseemly about this man’s attire. The oddly spacious cut of his garments, the excessive makeup topped off with the lurid, slightly pornographic smile, the wig with its own gravitational pull. I agree that simply processing all of this input can be overwhelming, and the resulting confusion could lead to a life of crime and a fondness for calliope music. However, there is again one key factor which can greatly dilute the traumatic impact of such a vision standing beneath the golden arches and beckoning at your children. The misguided man underneath all that makeup? His name is actually Cletus. History has shown that no personage christened with this name has ever done anything of import, whether good, bad or indifferent, through all the ages of mankind. The sheer weight of bearing such a name has left the man unable to lift his arms long enough to do anything substantially harmful. You have nothing to fear from this man. You can calmly proceed to make your selection from the brightly-lit menu and pull up to the second window. Next, we have the freckle-faced Wendy, she of the pigtails and outdated, high-collared couture. Whilst I agree that she does indeed possess eyes of a disconcerting nature, with their ability to appear somewhat demonic depending on your angle of viewing and the time of day, I should point out that eyes alone cannot kill, despite many catchphrases and folklore tidbits that have popped up over the years. I should also point out that Wendy does not have an actual body. She is, in fact, nothing more than a disembodied head. Despite additional folklore stories wherein people are supposed to fear such things (as well as the reverse, the headless body), I can assure you that these wives’ tales are meaningless. After all, a head without a body has no immediate means of physical transport. I suppose the head could convince a bystander to place them in a menacing shopping cart and thrust said cart at you in a hurtful way, but it is very unlikely that this will happen. As long as parents train their youngsters that they should not talk to strange heads, and the children remember this caveat, then the only thing a disembodied head can do is yell insults and comment sarcastically about your attire. And now we arrive at one Colonel Sanders, with his odd bow tie, mystifying wisp of a goatee, and his subversive attempt to appear grandfatherly and benign. To be fair, I suppose we could credit his suspiciously beady eyes to something physical, such as myopia or severe intestinal distress. I’m certainly not going to discount the potential for biological mayhem and destruction that his eyes might be revealing, but I think it’s the lesser of two evils in this situation. I believe you are much more on target with the “secret herbs and spices” angle. What does this really mean? After all, every restaurant chain has secret recipes. If your recipes were public, then everyone could make them and there would be no point in anyone driving across town to purchase your pungent poultry. Your company would go bankrupt and your family would not get anything pretty for Christmas, leading to alcohol abuse, divorce proceedings, and very sad poems written at midnight while Tori Amos songs play in the background. So, there you have it. Colonel Sanders is not trying to kill you. He is merely proud of winning and wants to ensure you know that he has something better than you do. While boastfulness can be annoying and slightly rude, it is not nearly as unsavory as homicidal tendencies or the desire to maim you with a grease-stained paper bucket. 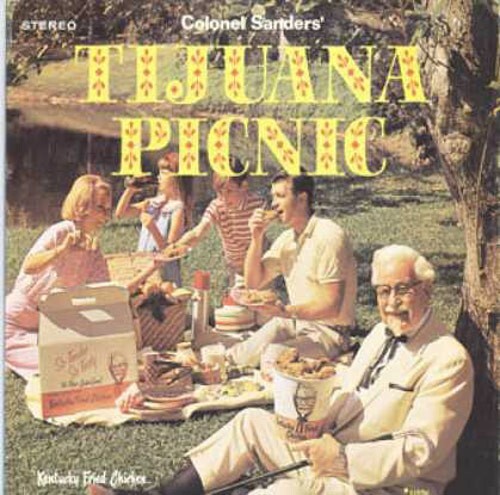 Aside: There is a possible third scenario here, wherein the “herbs and spices” catchphrase is actually down-low speak for marijuana, indicating that the Colonel had an overt fondness for Mary Jane. I suppose this is possible, but even if that’s the case, how many stoned people have you known that actually have the focus to carry out any serial-killer shenanigans? None. They are usually too busy laughing hysterically at unfunny things, eating Doritos with the intensity of a woodpecker, or swearing to be best friends forever with people they just met. Not that I would know any of this personally, mind you. And finally, we approach the last of your concerns about purchasing cheap food on the run. This scenario involves the high-end purveyor of Mexican entrees, the inestimable Taco Bell, and their spokes-dog. Although I could ramble on for pages, because I do so enjoy listening to myself, the abeyance of your misgivings is quite easy to accomplish. The chihuahua in question has gone to the PR firm in the sky. Thus, any further issues you continue to have with the previously-perky pet point to an entirely different set of potential neurological complications. If your heart still races when approaching Taco Bell, then you have some serious alternate foibles that need exploring. Please schedule another session with Lanae at the front desk. Well, then. It seems that we have successfully neutralized any identifiable reasons that might prevent you from experiencing the joy of speaking into a clown’s mouth and ordering cholesterol-laden food imitations. Please, pile your family into a vehicle of your choice, and head for the nearest drive-thru. Bit of advice: Be sure to specify to the clown any condiment packets that you may require. They’ve been awfully tight with those things lately. There’s nothing worse than arriving at your domicile and discovering that you don’t have enough salsa to properly lubricate your burrito. A Colonel Sanders Album – My Gpd, what did he sing about? The mind truly boggles. I am SO not going there – I have had enough Trauma in my life. One of my great uncles was a ringer for Colonel Sanders. He knew how to use it. He grew a goatee, bought a white suit and bow tie. He and his wife then proceeded to eat their way across the USA almost never paying for a meal. I knew you’d appreciate the story. I think those people are goiing a tad nutso with all that chicken – and it appears to me that the Colonel is being very selfish with his bucket. My personal preference for a picnic is bread, cheese, wine, and fruit – No children allowed. The chihuahua of Taco Bell fame might have gone to that Great Taco Buffet in the Sky, but her (his? those little dogs, who can tell??) progeny lives on. Witness Hunydog. I’ve actually eaten at Taco Bell (don’t tell anyone. My gourmet standing would never survive), but those Cheesy Gorditas? Call out to one in the night…I digress. Hunydog has gotten free food FROM Taco Bell because someone recognized her. She doesn’t speak very good Spanish though and the whole “Yo Quiero…” business makes her tilt her head to one side and stare venomously at whomever is speaking. You can’t tell if she’s plotting which ankle to bite or if she’s trying to decipher what the hell “Yo Quiero” might mean and whether it has anything to do with food. As Peggy pointed out, sometimes it’s all in who one might resemble…..
I’m concerned with how much you know about fast food mascots. I mean, who knows the real name of Ronald McDonald AND admits it? That being said, please spill all you know about Jack, he of ‘in the Box’. I have reason to believe he’s an international terrorist, but I need more proof. The album is all instrumental but it’s pretty good. But do you know why there isn’t any percussion on the album? Col. Sanders ate the drumsticks. Thank you, very much.